Seeking God: Nineteen young men attended their recent annual Quo Vadis discernment weekend, the largest number is 22 years. RECORD numbers of young men are discerning the priesthood in the Brisbane archdiocese with “extraordinary” hopes for next year’s seminary intake. 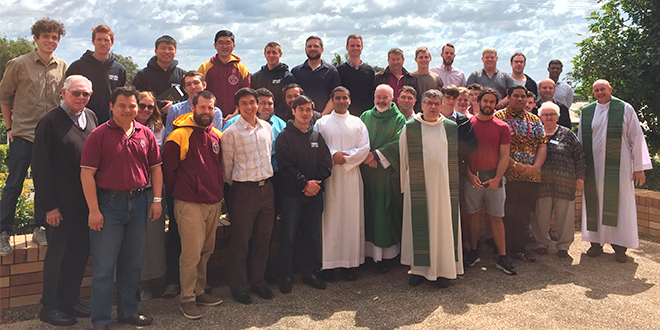 Vocation Brisbane director Fr Morgan Batt said nineteen young men attended their recent annual Quo Vadis discernment weekend, the largest number in 22 years. Discernment weekends allow young men to spend a weekend at Holy Spirit seminary in Brisbane, joining seminarians studying for the priesthood in prayer and Mass. From the discernment weekend, Fr Batt said the Vocation Brisbane office was hopeful that an “extraordinary number” of young men would enter the seminary next year. Fr Batt said the Quo Vadis weekend had helped open the doors for young men to discern the priesthood without prejudice. “I think it’s an affirming movement of the Church for young men to explore the call and be listened to, not to be told this is not for you,” Fr Batt said. Fr Batt has been director of Brisbane’s vocations ministry for six years and said he made a five-year plan for the office. The plan included increasing the numbers of men living in the Archdiocese’s discernment house, Canali House, grow the number of vocations and reinvigorate his ministry’s office. “And we have accomplished that,” Fr Batt said.